The first corporate jet to feature an EFIS cockpit, the Raytheon Hawker 800 is the successor to the Hawker 700, upgrading range capabilities and fuel efficiency. The Hawker 800 is recognized for take off performance along with its durability and versatility, safely transporting a maximum of eight passengers. 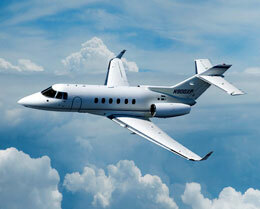 The British Aerospace Corporation designed the Hawker 800 and the Hawker Beechcraft Corporation assembled the aircraft. 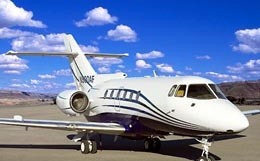 The Hawker 800 was designed as a twin engine mid sized private corporate jet. The Hawker 800 was designed to improve on British Aerospace’s 125-700 series. 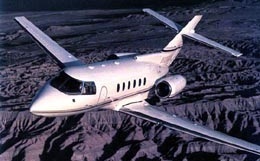 The first Hawker 800 model was ready for its first flight in May of 1983. The 800 series became a huge success for the British Aerospace Corporation. 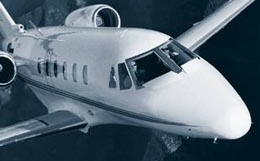 In just over five years after the first flight of the Hawker 800, the corporation would be registering the 200th sale in the 800 series. Production on the Hawker 800 started in 1983 and ended in 2013. 650 aircraft have been built so far. The cabin of the Hawker 800 measures 21.3 feet in length, reaches 5.8 feet in height, and stretches a maximum of 6.0 feet in width with a floor width of 4.4 feet. 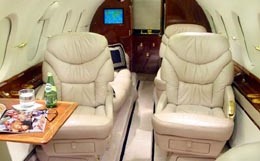 The cabin of the Hawker 800 is typically configured to accommodate eight passengers in a corporate layout, but can be arranged to seat fourteen in a higher density seating configuration. This private business jet features 40 cubic feet of baggage storage, allowing ample room for your luggage needs. Twelve windows surround the cabin, providing a bright atmosphere perfect for working while on your flight or relaxing and enjoying the view. With a maximum cabin pressure differential of 8.6 psi, the Hawker 800 is capable of maintaining a sea level cabin altitude at an altitude of 22,200 feet. The Hawker 800 comes equipped with two AlliedSignal TFE731-5R-1H turbofan engines. Each engine is rated at 4,200 pounds of thrust at take off. At sea level and on a standard day, the Hawker 800 requires just 5,600 feet of runway to take off. At an airport with an elevation of 5,000 feet, this take off requirement increases to 9,800 feet of runway. With four passengers, the Hawker 800 needs only 2,325 feet of runway to land. This private business jet features a range of 2,392 nautical miles and a maximum certificated service ceiling of 41,000 feet. For a flight to a further destination, the Hawker 800 is capable of maintaining an airspeed of 401 knots at an altitude of 41,000 feet in a long range cruise configuration. For a swifter flight, the Hawker 800 is capable of maintaining an airspeed of 442 knots at an altitude of 37,000 feet in a high speed cruise configuration. The Hawker 800 is standardly equipped with the Honeywell SPZ-8000 integrated digital flight guidance system avionics suite. This system utilizes five screens in conjunction with assorted analog controls to display pertinent flight information. Instrumentation incorporated in this suite include a global positioning system (GPS), dual Honeywell laser inertial reference systems (IRSs), high frequency communication capability, a Ground Proximity Warning System (GPWS), dual Collins communication and navigation radios, Flight Management System (FMS), dual autopilot capabilities, and Traffic Collision Avoidance System II (TCAS II). Additional instrumentation options include dual FMS, triple laser inertial navigation system (INS), and an air to ground telephone. For more information about chartering, leasing or buying a Hawker 800 please contact us by calling +44-20-3874-8091 or send us an email here.